For 60 years, Loyd Builders has been committed to “building better.” Your project won’t be just a page in someone’s portfolio. For us, it’s a promise to deliver top-quality construction alongside small-town, personal attention. Our management team has more than two centuries of collective expertise in the construction industry. We’ve built some of the region’s most innovative schools, state-of-the-art hospitals, and awe-inspiring historic renovations. But, we’ve never forgotten where we came from - and we never will. Originally known as PEL Construction, Allen Loyd launched his construction business in Ottawa, Kansas, in 1959. The company largely focused on residential construction. When Sonny Burch and Jerry Thompson joined the company, they changed the name to Loyd Construction Co. and began blending in more commercial construction. They completed their first commercial project, a Safeway grocery store, in 1963. By the end of the 1960s, Loyd Builders focused exclusively on commercial & light industrial projects. In 1988, Allen sold the company to Sonny and Jerry, and the focus shifted toward construction management with less trade work self-performed. By the late 1990s and early 2000s, Loyd Builders expanded its territory, taking on several projects in Western Kansas. 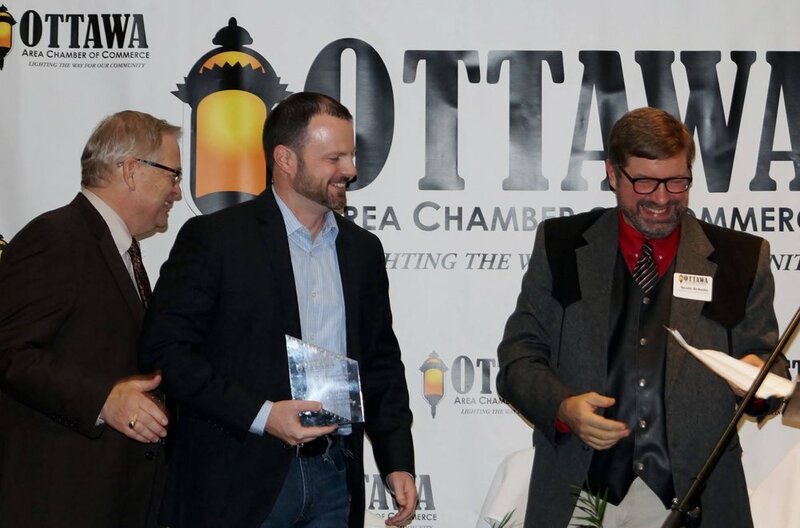 Josh Walker named “Entrepreneur of the Year” by the Ottawa Area Chamber of Commerce. Ottawa native Josh Walker grew up in the construction business, sweeping the shop floors at Loyd Builders where his father Sam worked (and still works). After graduating from Pittsburg State University with a degree in Construction Engineering, Josh spearheaded a wide range of projects as a Project Manager for five years with one of the largest general contracting firms in Kansas City. But, Josh believed there was a better way to do business. He wanted to offer large-scale construction expertise blended with a small-town, personal approach. In 2007, he returned home, first with a minority stake in the company before purchasing Loyd Builders in 2011. Today, Loyd is one of the region’s most respected general contracting firms, completing more than $35 million in annual revenue throughout Kansas and Western Missouri. Our mission of “building better” is rooted in Josh’s philosophy that top-quality construction services start with being genuinely invested in the project, in the people, and in the communities we serve. You’ll see the difference in everything we do.